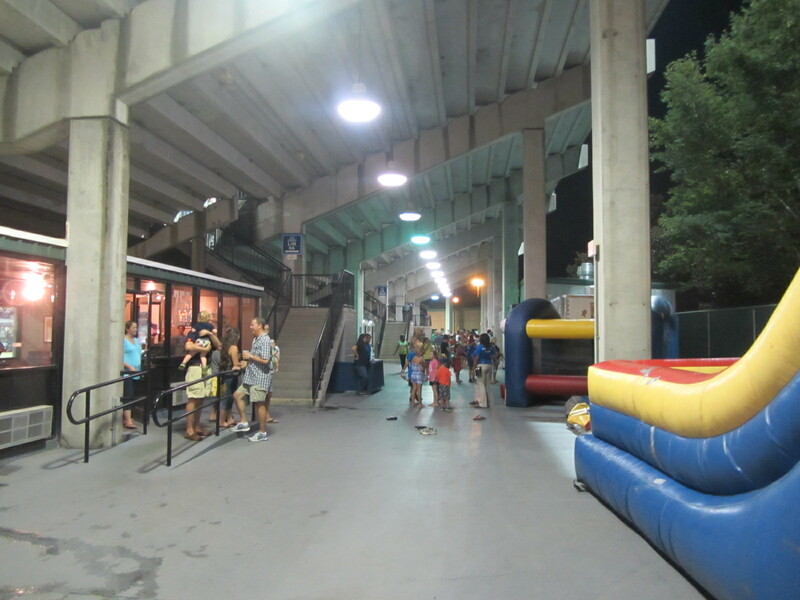 To see all posts from my July 31, 2015 visit to the Mobile BayBears (this is Part Three) click HERE. To see all of the posts from my July/August 2015 trip through the Deep South, click HERE. 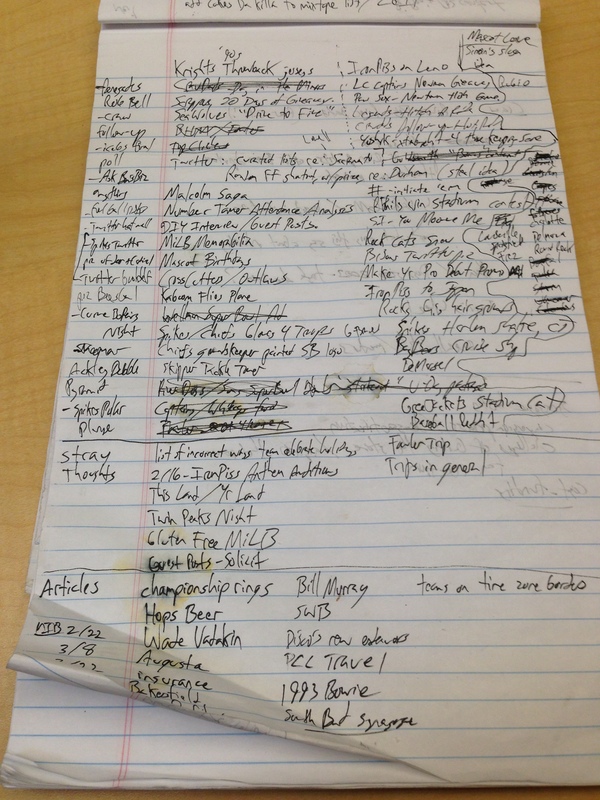 To see ALL of my “On the Road” posts (going back to 2010), click HERE. 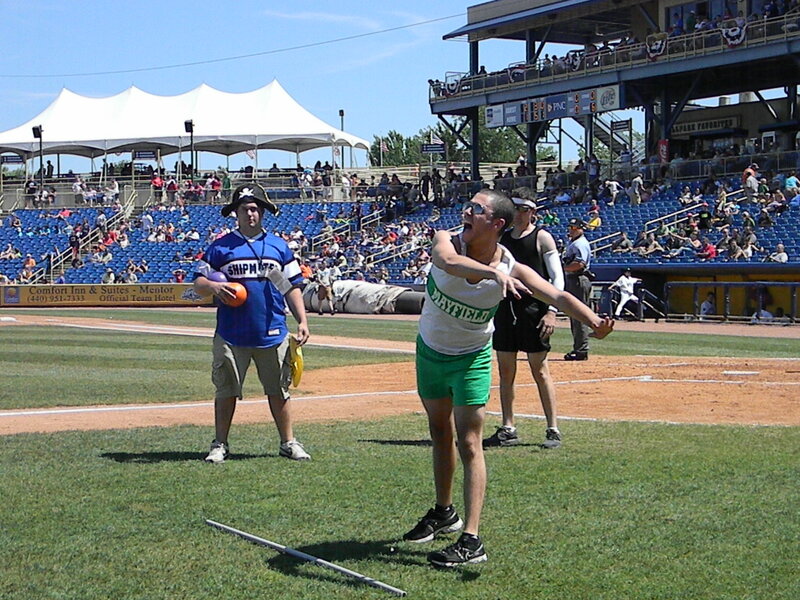 On July 31, David had found a novel way to get involved in the world of sports. 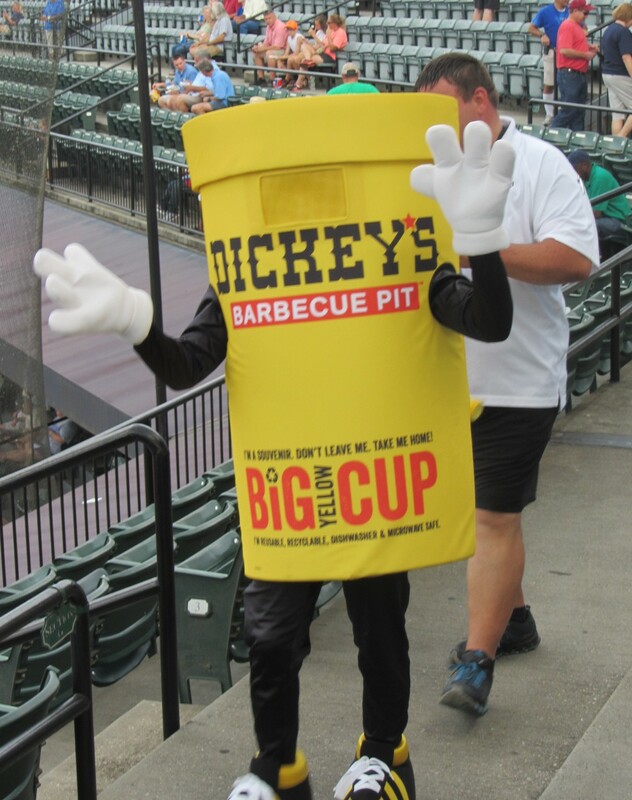 For on this evening, he had been recruited to serve as my designated eater (you know, the individual who consumes the ballpark cuisine that my gluten-free diet prohibits). 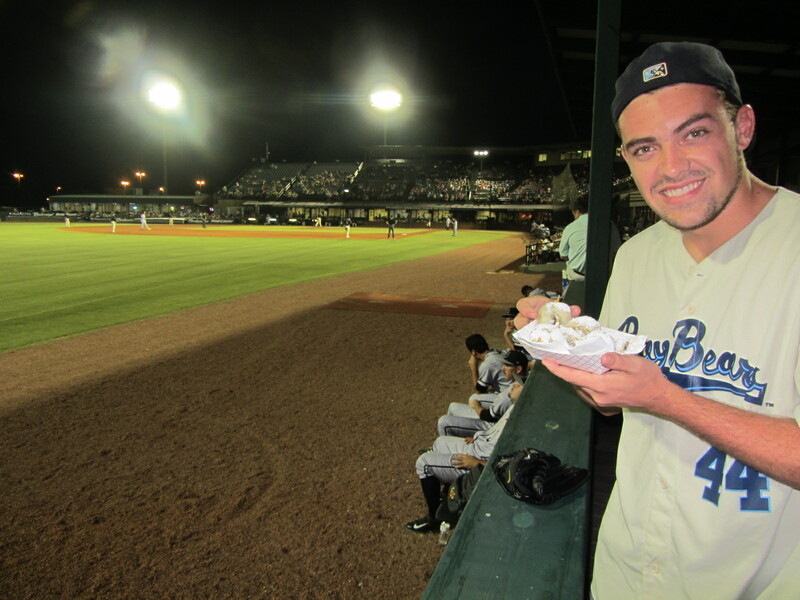 We met shortly after the game began, and David spent several innings partaking of the local foodstuffs. By the end of our time together, I imagine that he was feeling quite food-stuffed. 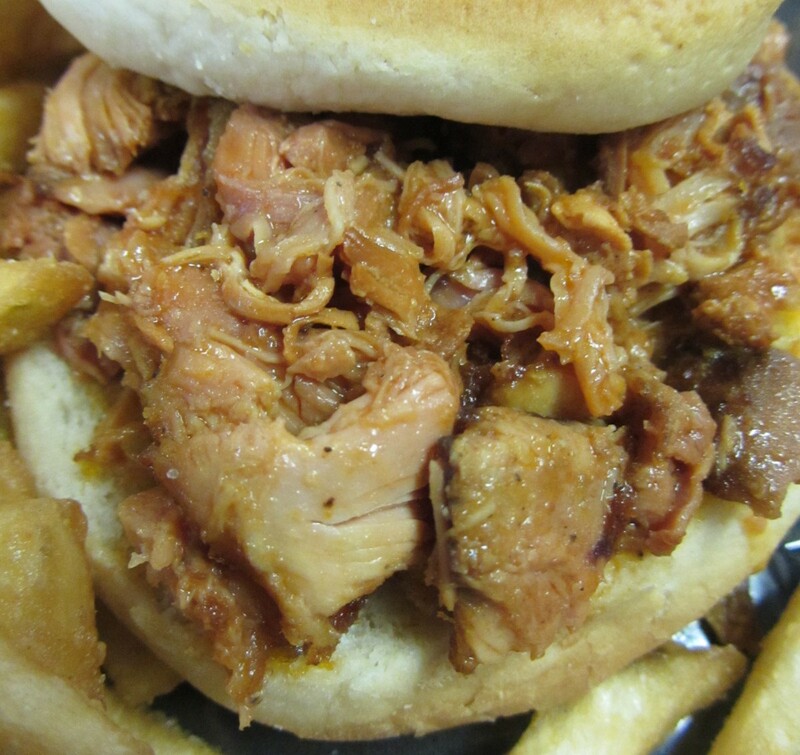 David was happy to be eating this hometown staple. 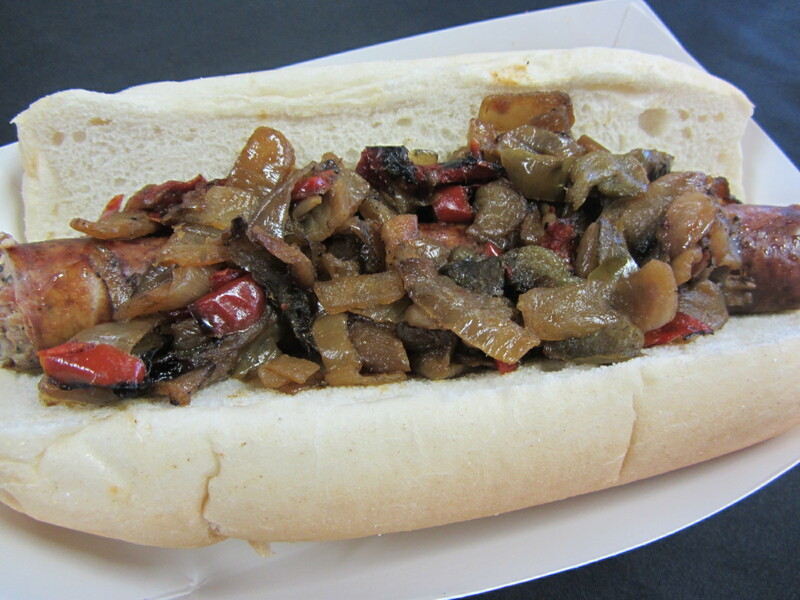 In summary: David likes this sausage. 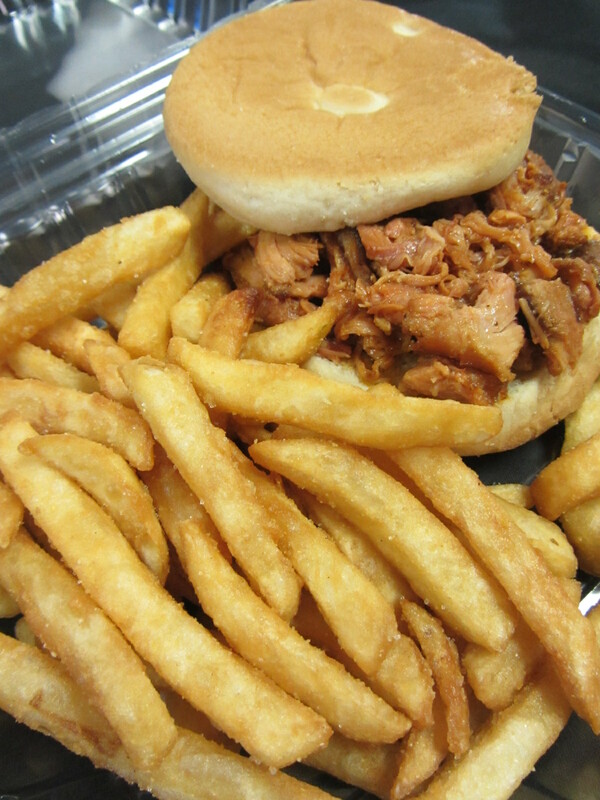 Next up was a barbecue pulled chicken sandwich, served with fries. Good things come in threes, so David and I then went off in search of dessert. Our quest ended on the far end of the third base side of the concourse. 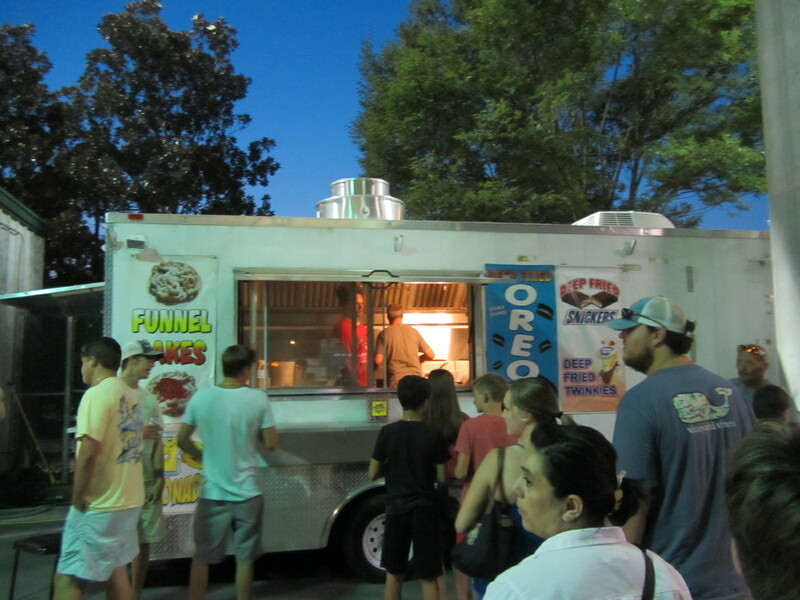 Deep-fried Oreos were procured from this sedentary vehicle, and we then found an idyllic location in which to enjoy them. During our brief time together, I learned that David is a musician. 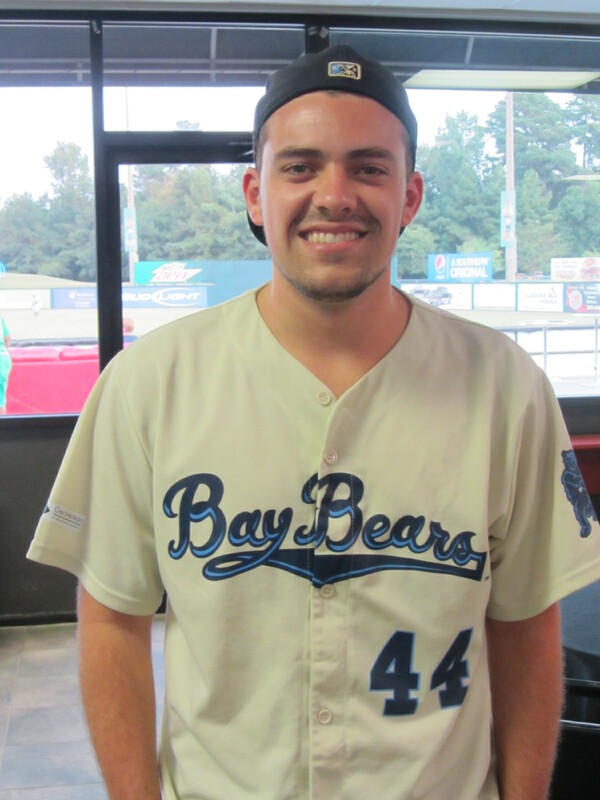 He plays in RamCorps — the University of Mobile brass and percussion band — and does some singing “on the side.” Earlier in the season, he performed the National Anthem at a BayBears game. With all this mind, I asked David if he would mind singing for his dessert. He obliged, and the results were, in a word, excellent. The lyrics have been embedded within my head ever since. 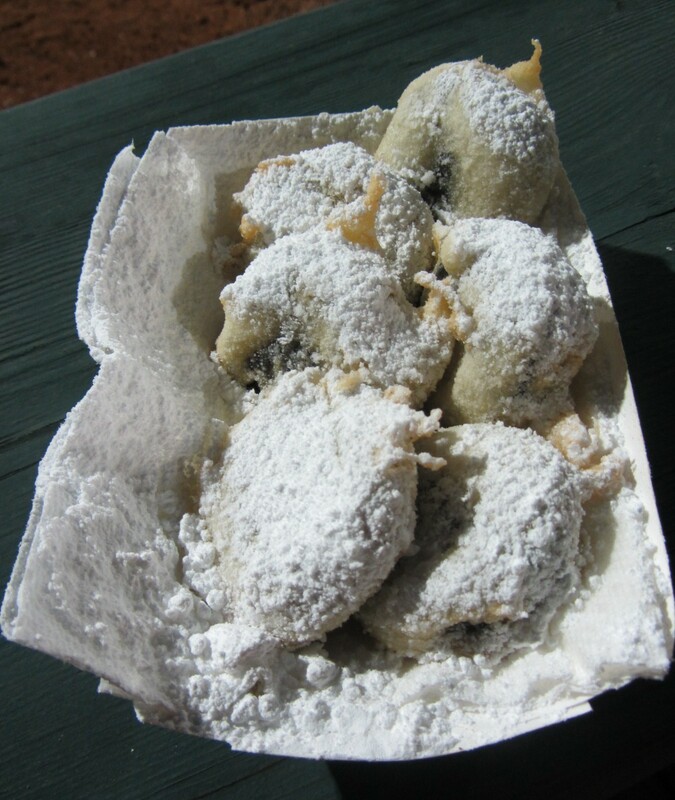 Sing it with me, everyone: Deep-fried Oreos. 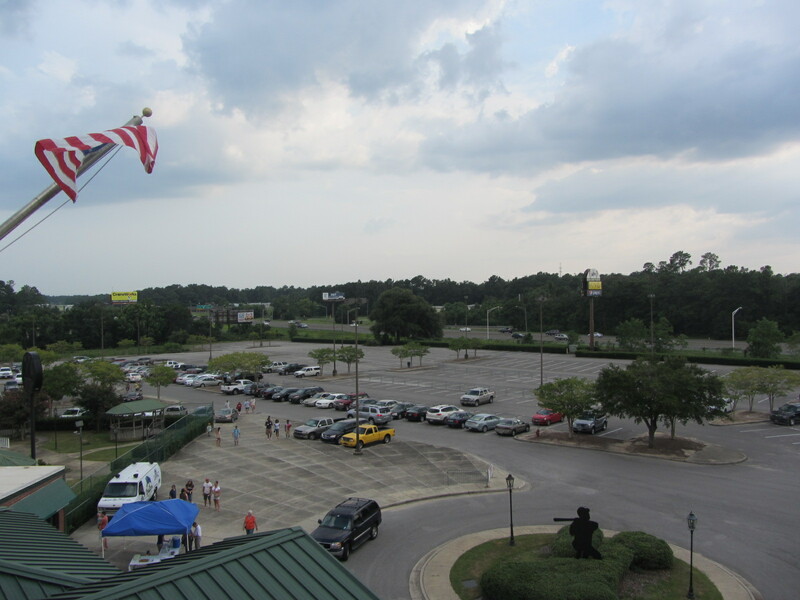 To see all posts from my July 31, 2015 visit to the Mobile BayBears (this is Part Two) click HERE. 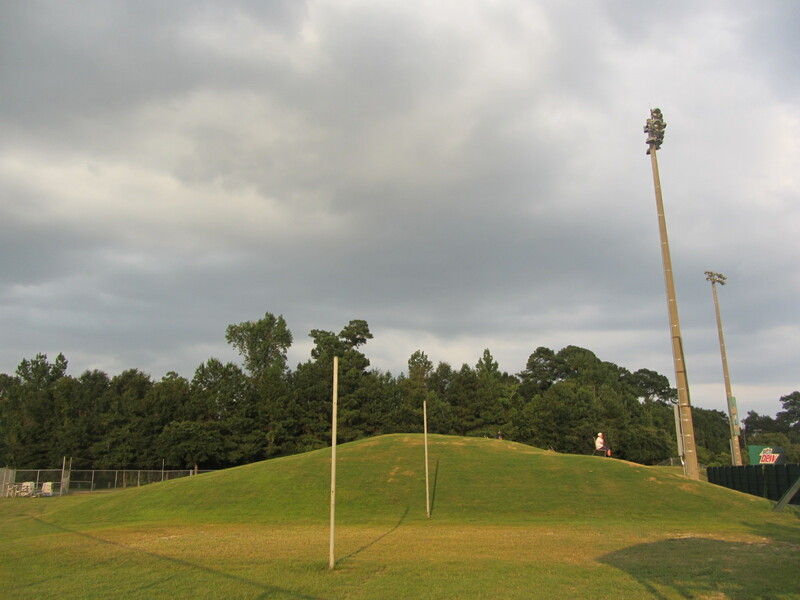 To see all of the posts from my July/August 2015 trip through the Deep South, click HERE. 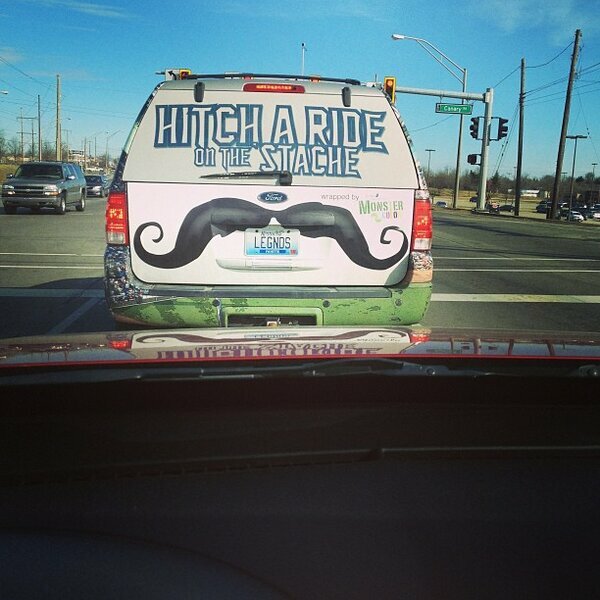 To see ALL of my “On the Road” posts (going back to 2010), click HERE. 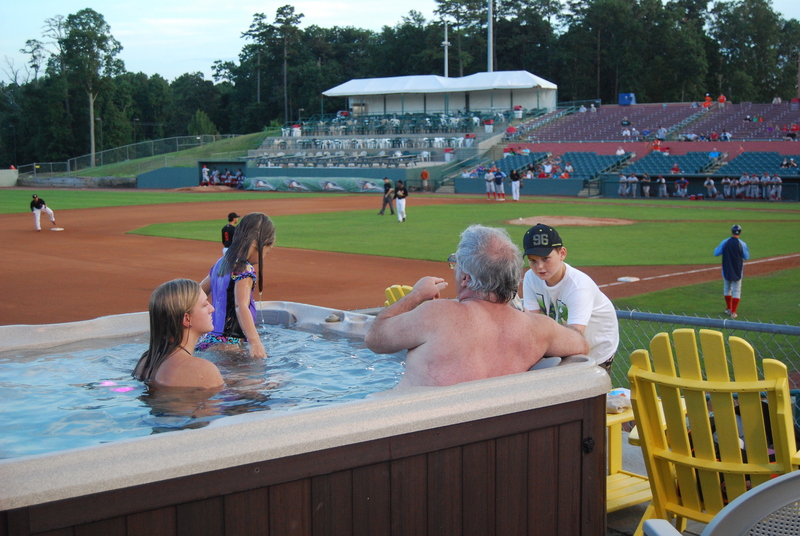 Whenever I visit a Minor League ballpark, I never sit still. I am always wandering and wondering, wondering and wandering. “Where should I be right now? Who should I be talking to?” I am mobile, in other words, and on this evening I enjoyed the rare distinction of being mobile in Mobile. Hence, the headline of this post. I don’t know why I felt the need to explain it. 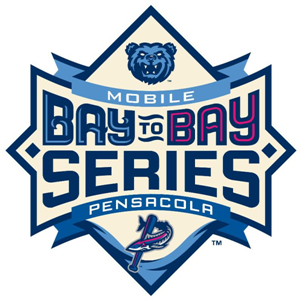 Anyhow, this is Part Two of this Mobile BayBears blogging saga. 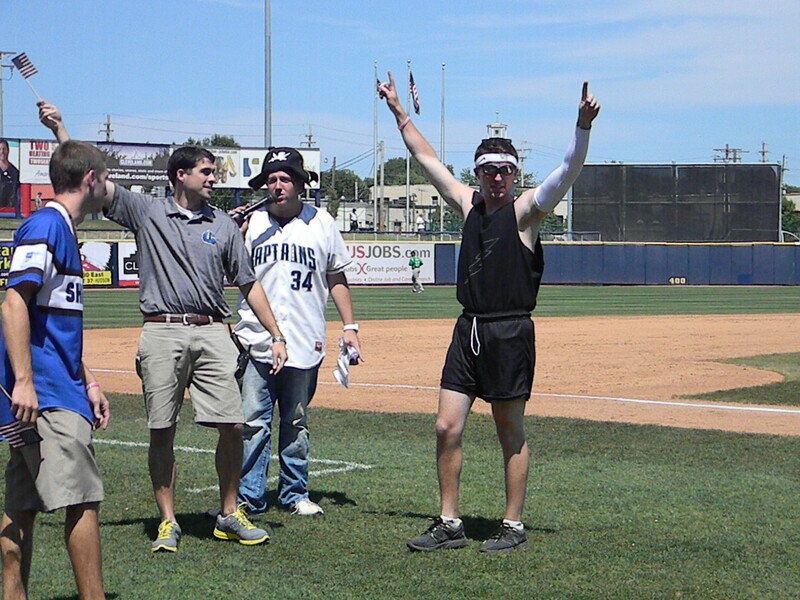 Part One described the wandering that took place prior to the ballgame, while this post involves that which took place during the game itself. 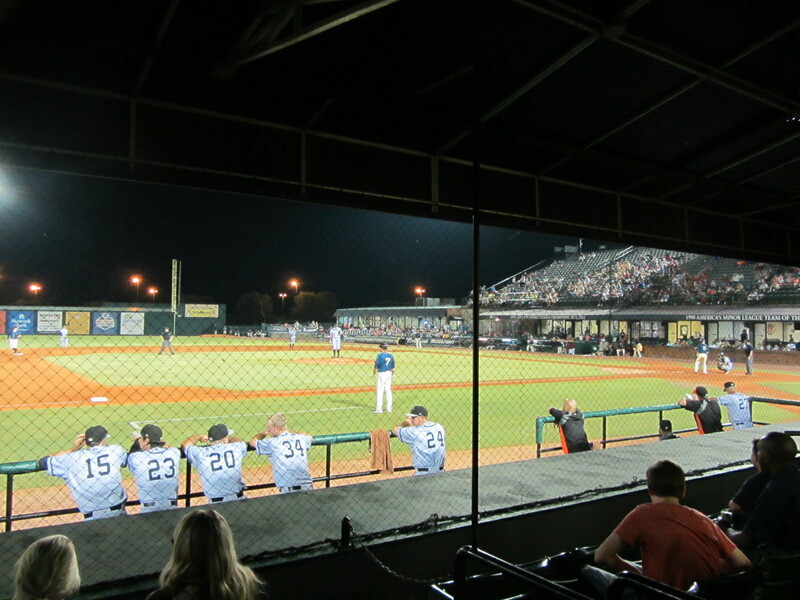 It was July 31, and the BayBears were playing the Jacksonville Suns under a full moon. 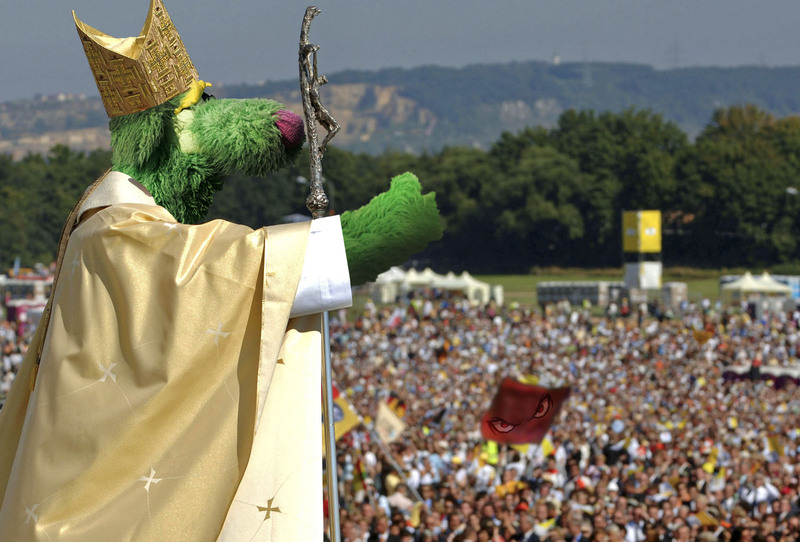 So, you know: Play Ball! Beneath the hulking concrete edifice seen above, there is a concourse. 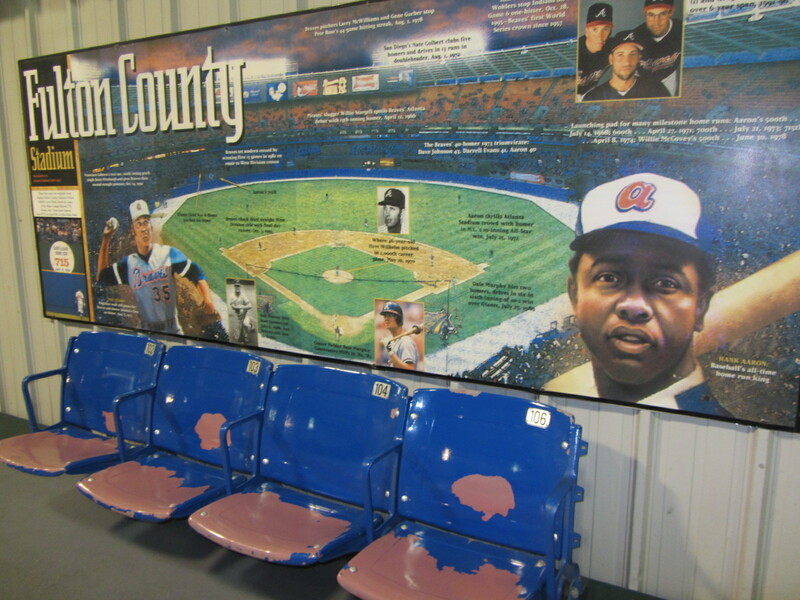 This concourse contains many interesting things, such as a quartet of seats from the Atlanta Braves’ former home of Fulton County Stadium. 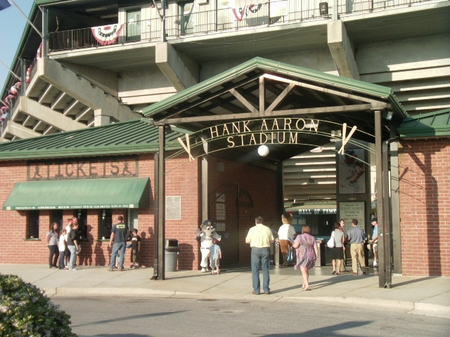 Hank Aaron, Mobile native, played in this stadium for nine seasons (1966-74). Here’s the exterior of the Museum, as it looked during an earlier, brighter portion of the day. 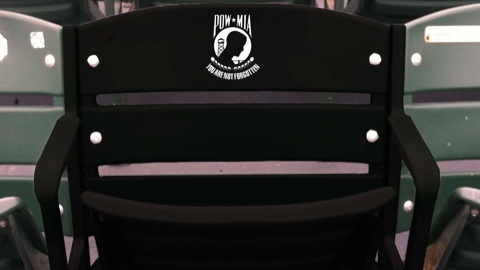 The Museum is open during all home games. As I approached the front door on this Friday evening, there was no one else around. No team employees, and no fans. I almost felt like I was trespassing. The door was unlocked, however, and upon entering I was greeted by a loud voice. I wish that I could report that Aaron himself was there to greet me, but it was simply an introductory video playing on a loop in the front room. Here’s a quick Vine collage featuring some of what can be found within the Museum. Much of the memorabilia chronicles highlights from throughout Hank’s long career. 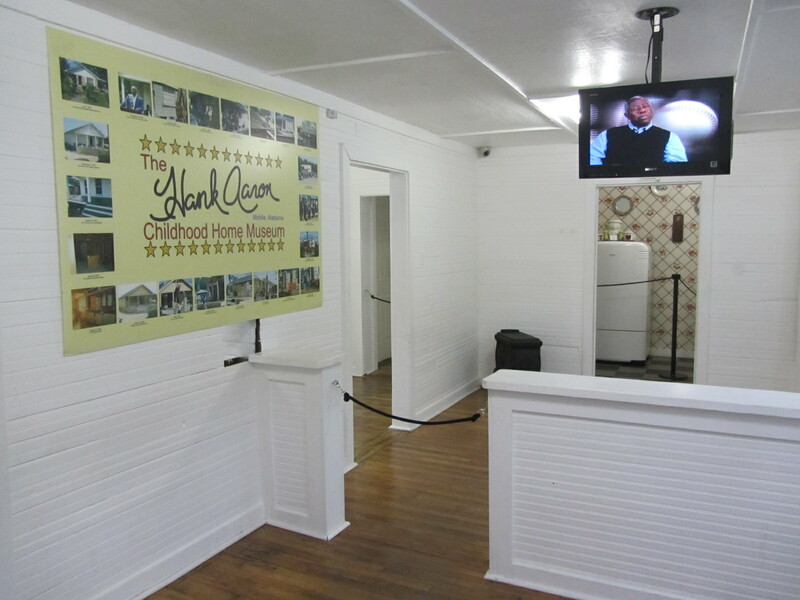 But even more interesting, in my estimation, is the recreation of the kitchen. This is how it looked during Hank’s childhood, some 70 or so years ago. 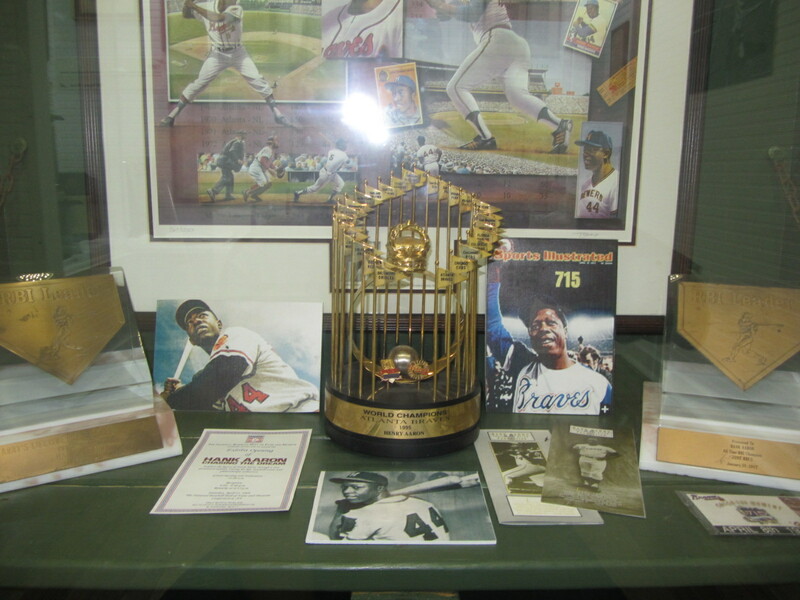 I wasn’t in the Museum for very long, as I felt anxious to get back to the ballgame. In these situations, it is always best to be Aaron on the side of caution. 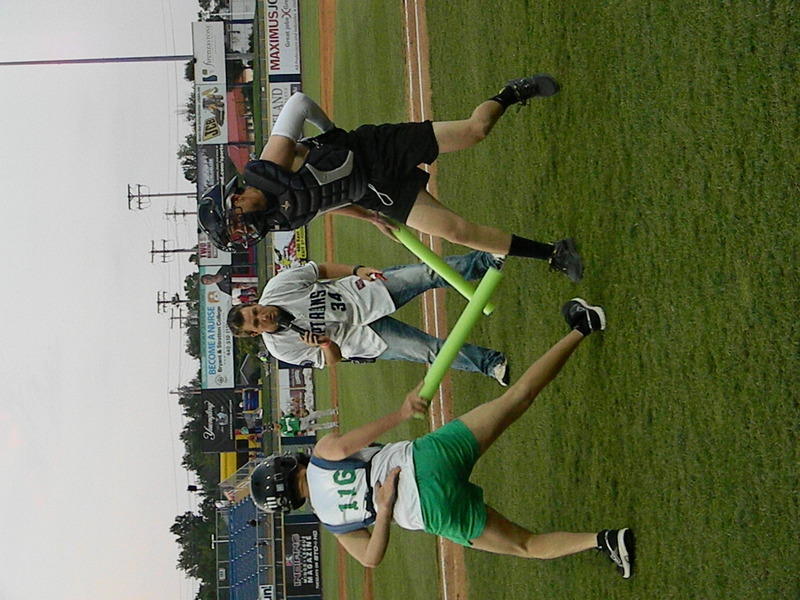 It was now the bottom of the sixth inning, and outs were hard to come by. 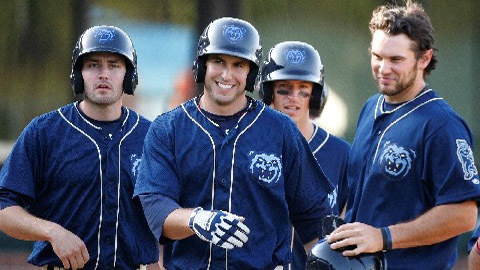 The BayBears batted around in the frame, which included a pitching change, and many of the at-bats were long and drawn out and punctuated by a barrage of foul balls. I mention this because, throughout the entire half-inning, a penned-in gaggle of young fans were (not so) patiently waiting for the opportunity to chase mascot Teddy across the outfield. After all that waiting, the chase kinda felt anti-climactic. 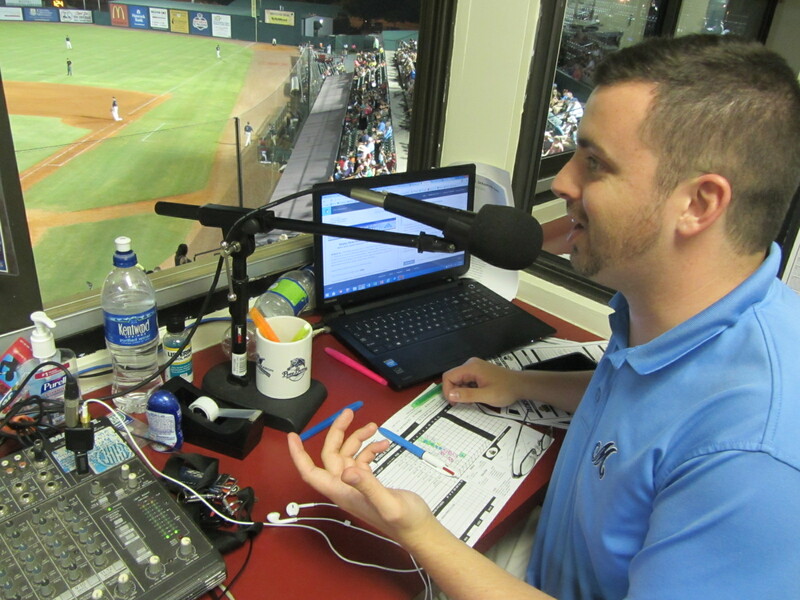 With no more mascot chases left to halfheartedly document, I headed up to the press box and enjoyed an inning on the air with BayBears broadcaster Justin Baker. 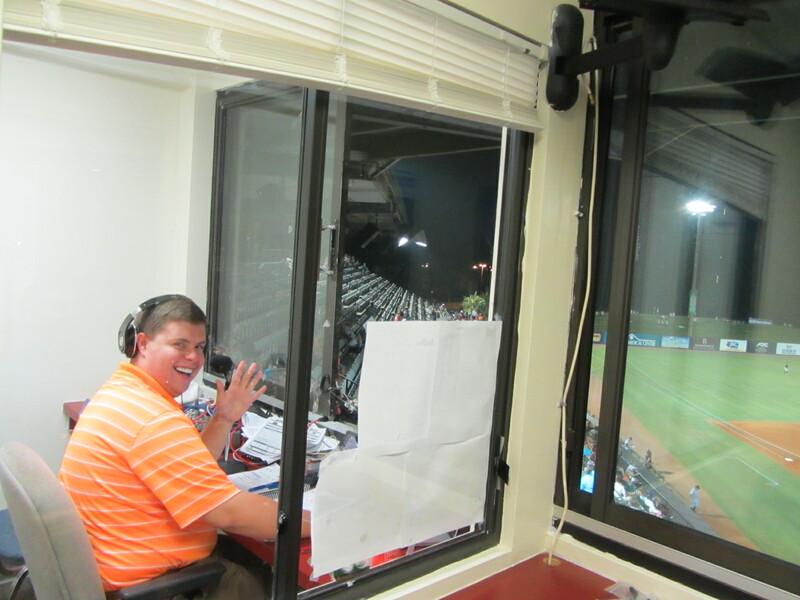 Jacksonville Suns play-by-play man Roger “One Take” Hoover offered his hello from the adjacent booth. 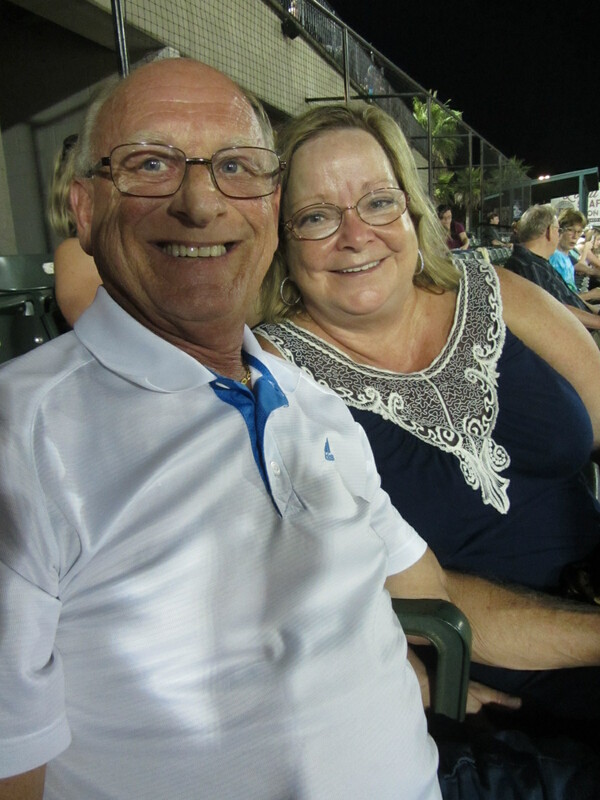 I then returned to field level to interview Terry Williams, 63, “the world’s oldest batboy.” Terry, pictured here with his wife, Beverly, just completed his second season as batboy — or bat man — for the Pensacola Blue Wahoos. 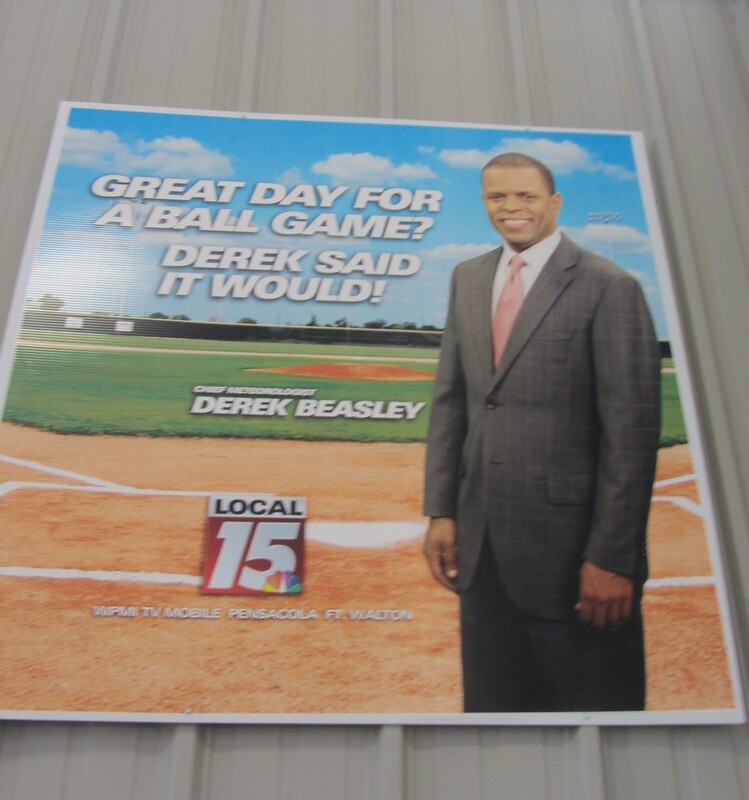 But on this evening in Mobile, he was simply enjoying watching a ballgame as a fan. 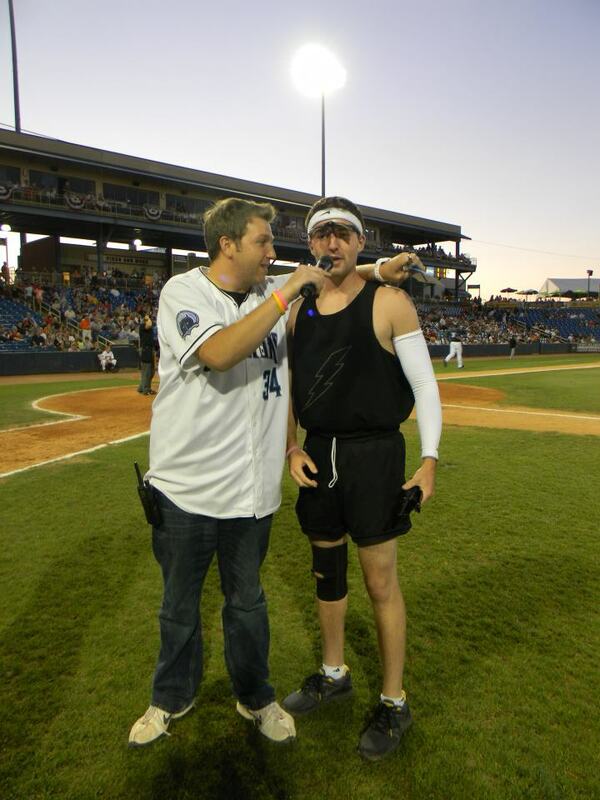 Shortly after speaking with Terry, the Suns wrapped up a 7-4 victory over the hometown squad. 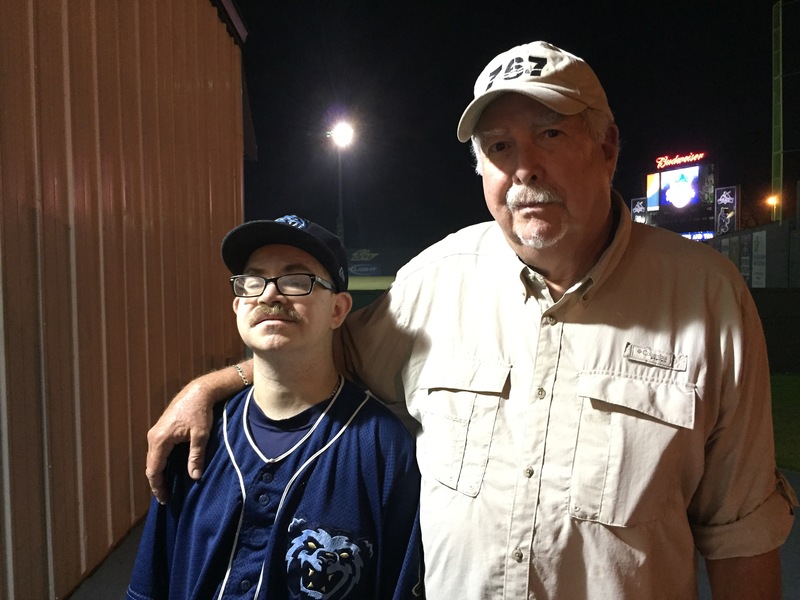 I then headed over to the BayBears dugout to interview yet another legendary Southern League batboy. This is Wade Vadakin, 36, and his father, Jeff. And that just about did it as regards my night in Mobile. In conclusion, I submit these six seconds of parking lot pretension. 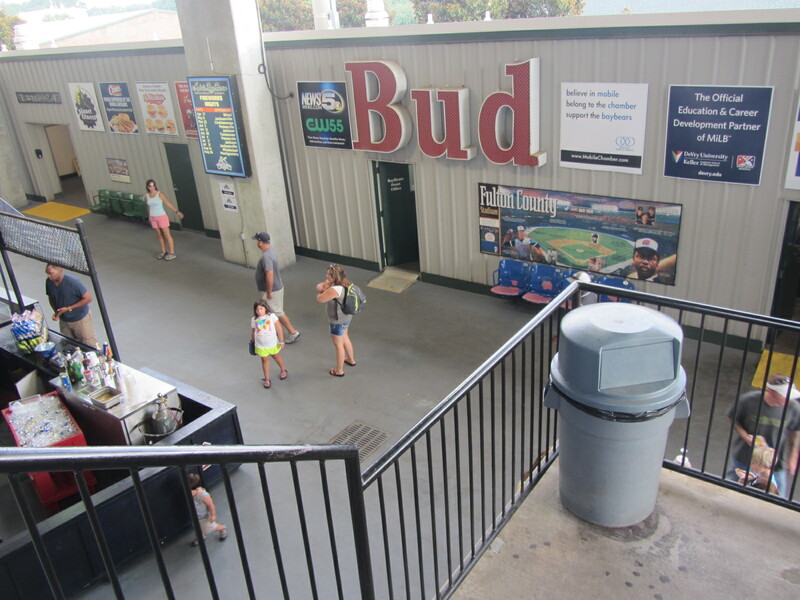 To see all posts from my July 31, 2015 visit to the Mobile BayBears (this is Part One) click HERE. 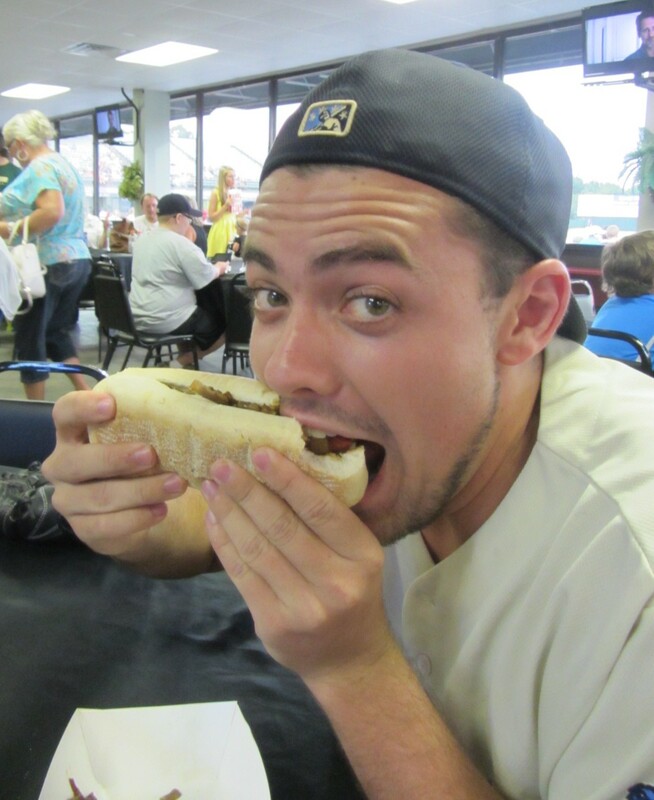 To see all of the posts from my July/August 2015 trip through the Deep South, click HERE. To see ALL of my “On the Road” posts (going back to 2010), click HERE. 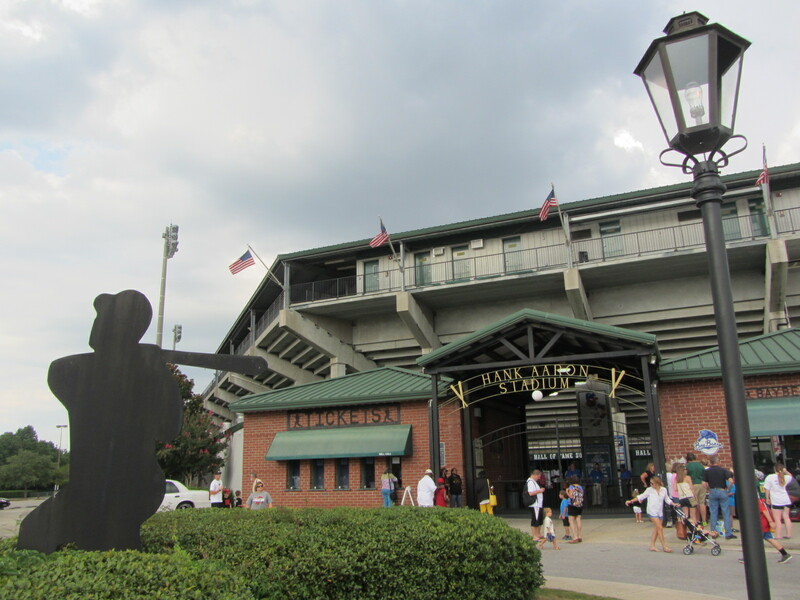 The last time I visited Hank Aaron Stadium, the home of the Mobile BayBears, Hank Aaron himself was in attendance. 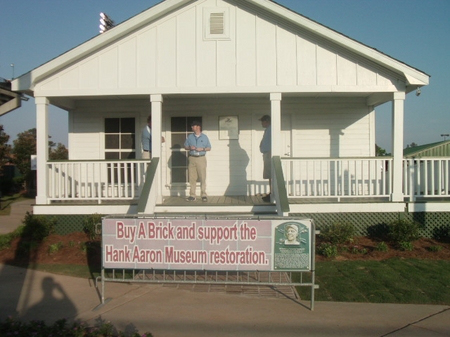 The year was 2010, and the occasion was the opening of the Hank Aaron Childhood Home and Museum. 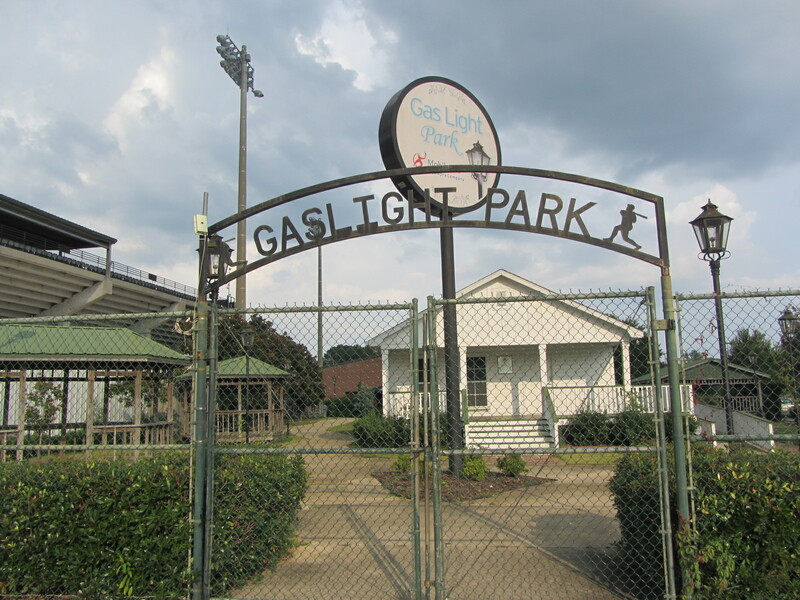 The name of this new attraction was nothing if not accurate, as the BayBears had relocated Hank’s childhood home (he grew up in Mobile) to the stadium grounds, renovated it, and stuffed it with memorabilia from throughout his long career. 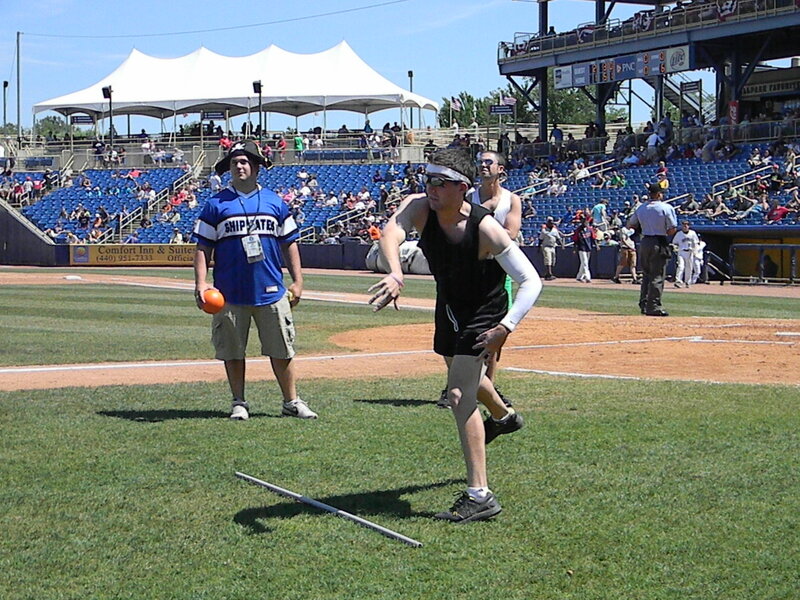 A cavalcade of baseball A-listers were on hand for this gala opening occasion. 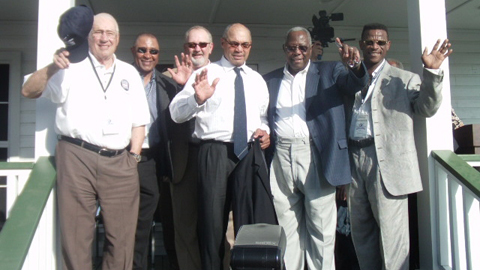 This photo, which I took after emerging bruised and bloodied from within a harrowing media scrum, includes Bob Feller, Ozzie Smith, Bruce Sutter, Reggie Jackson, Aaron and Rickey Henderson. Bud Selig was also in attendance, as was Willie Mays(!). I may never be in such close proximity to baseball royalty again, at least until I am named King of Baseball 2051, and I myself am baseball royalty. 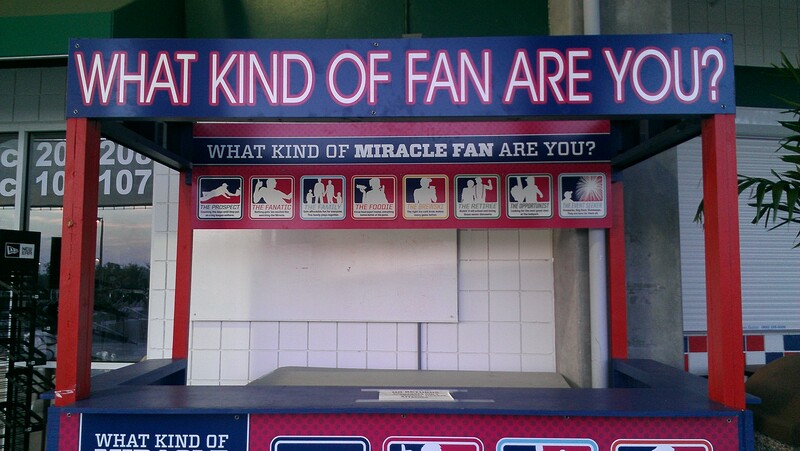 On that evening, I secured one-one-one interviews with Feller (RIP), Selig and Henderson. I was rebuffed by Reggie Jackson, however, who put his hand over my Flip Cam (remember those?) and slowly pushed it down without ever once making eye contact or speaking directly to me. The guy who Jackson was standing next to at the time — a D-backs front-office exec, if I remember correctly — felt embarrassed and tried to make small talk with me so that I wouldn’t feel like a total chump. Which I was. Which I am. 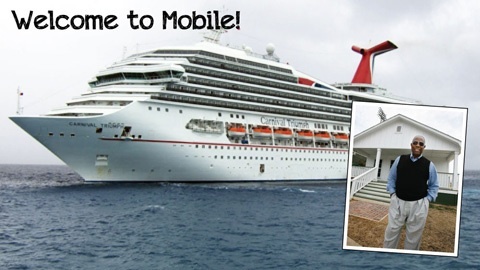 All of those memories came flooding back this past July 31, when I made a return trip to Mobile. On this evening, no Hall of Famers were in attendance. 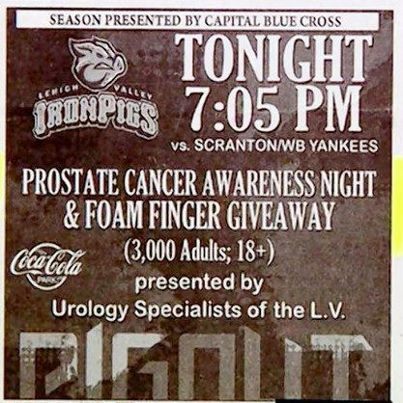 It was just a Friday night at the ballpark. 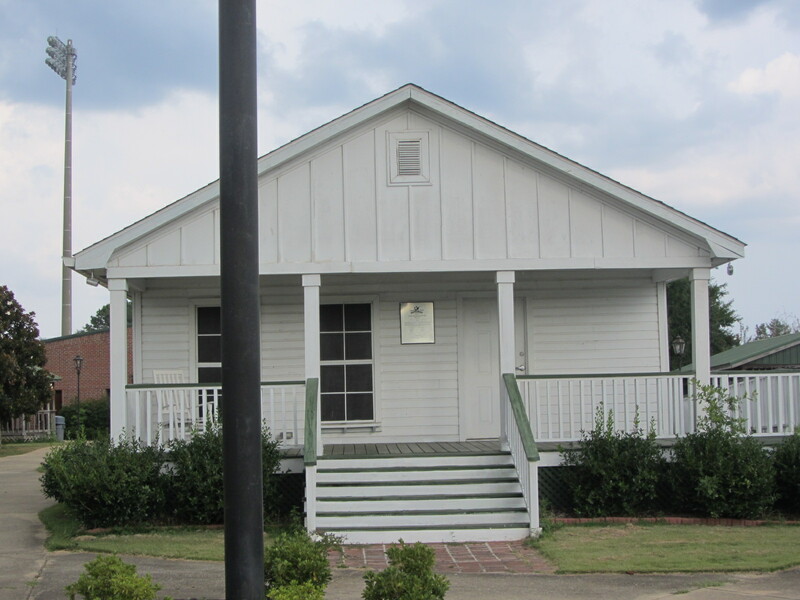 The Hank Aaron Childhood Home and Museum, open during all games, is to the right of the facility proper. 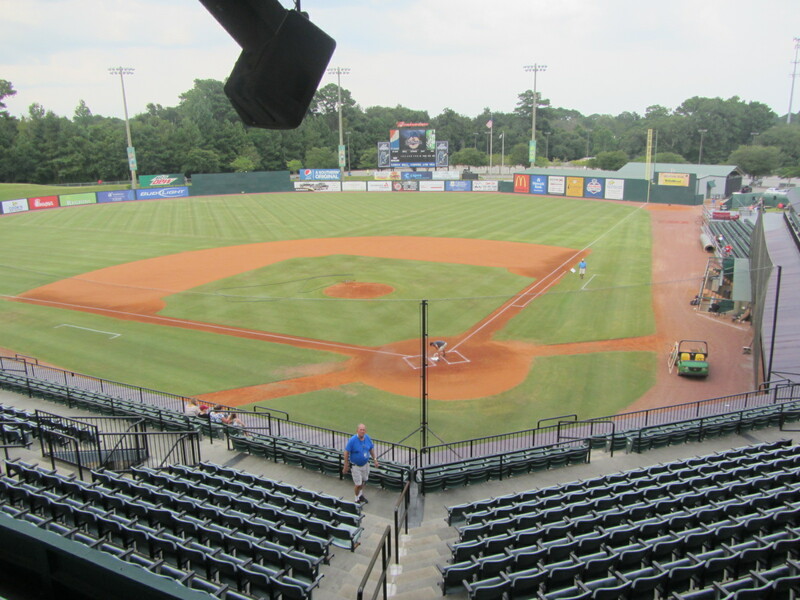 Hank Aaron Stadium opened in 1997, and it is now, somewhat improbably, the oldest stadium in the Southern League. 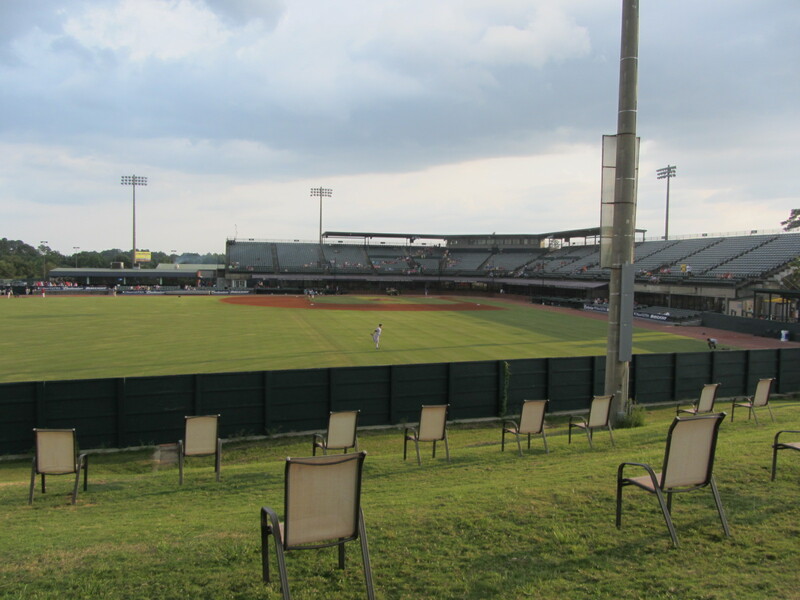 Attendance has dipped in recent seasons, at least partially due to the opening of new ballparks in nearby Pensacola and, now, Biloxi. The most unique design feature of the stadium — and, in my opinion, not a very good one — is that the suites are on the ground level. 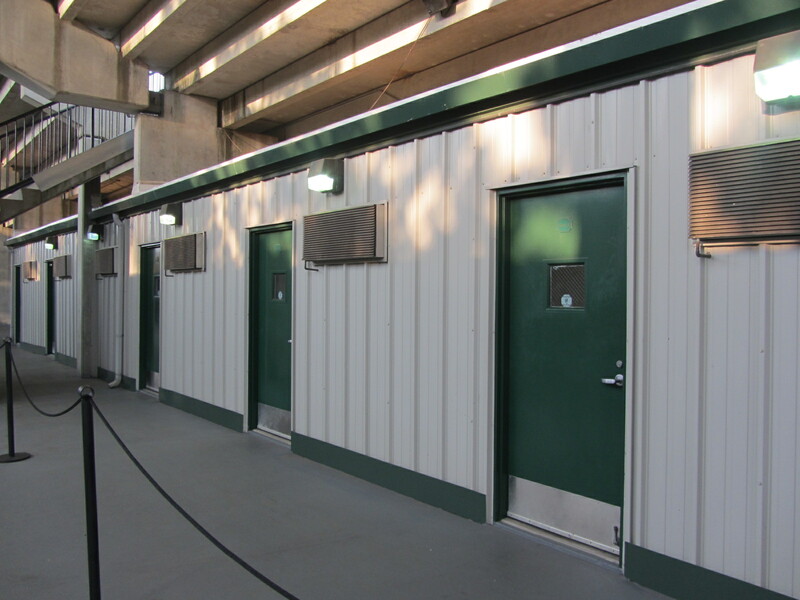 The suite entrances are lined up along the field-facing side of the concourse. This means that everyone who is not in a suite has to take the stairs to the upper level. There’s nothing wrong with walking up a flight of stairs — it’s good exercise! 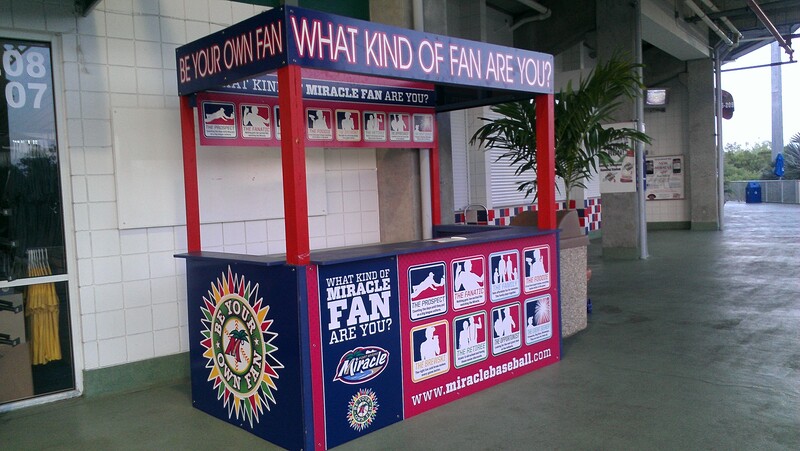 — but operationally speaking, it’s awkward for there to be a disconnect between where most fans are located and many of the places they are likely to want to be (concessions, restrooms, team store, etc). Here’s the “Upwardly Mobile” view, from the last row of the stadium. And here’s the view in the other direction. 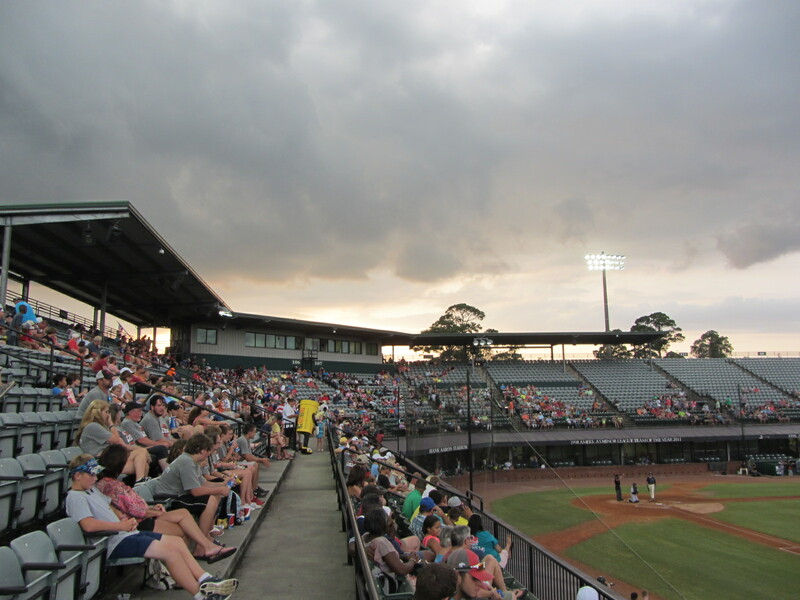 Hank Aaron Stadium is located in an indistinct portion of the city, surrounded by chain stores and shopping centers and the like. And then it was back to the concourse. This photo, it’s no good. 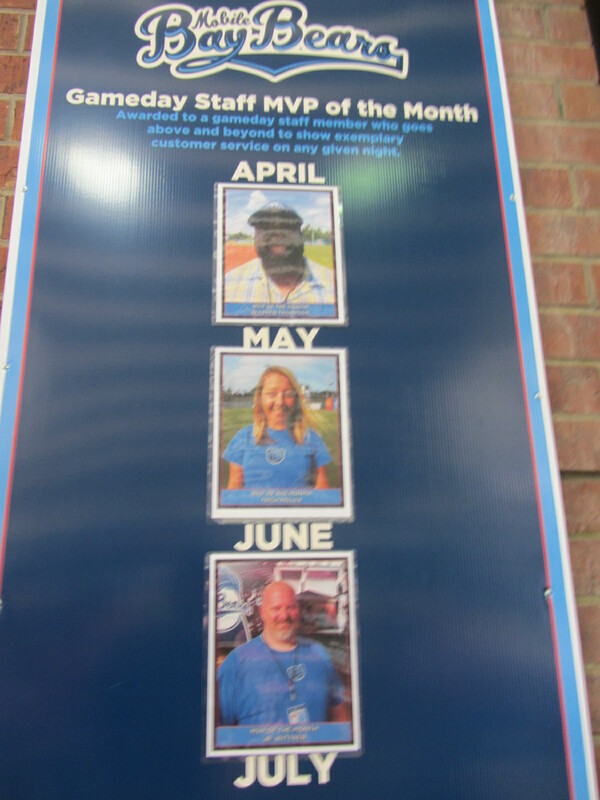 But file under “Good idea that other teams should steal.” Honor thy gameday staff, always! I stared at this ad for a while and could not determine weather or not it was grammatically correct. 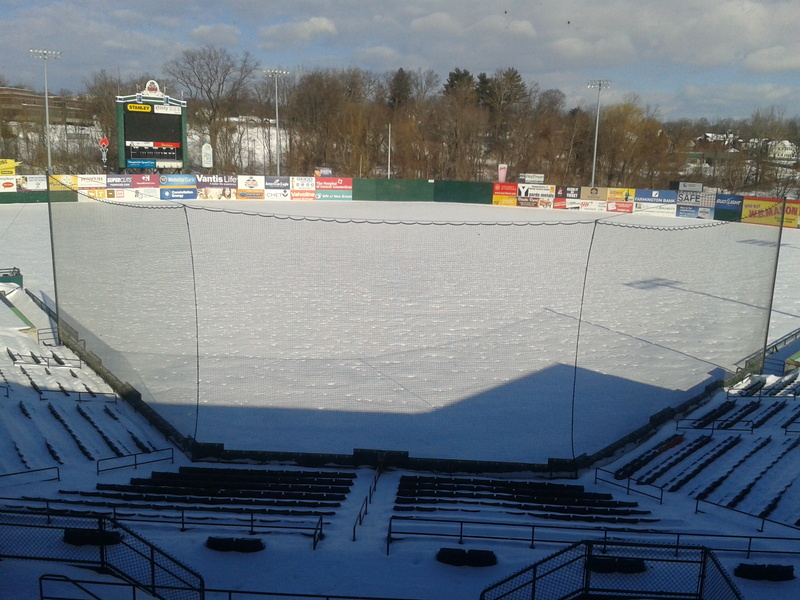 This was the vantage point as I approached the berm from the left field side of the stadium. It looks to be a par four. 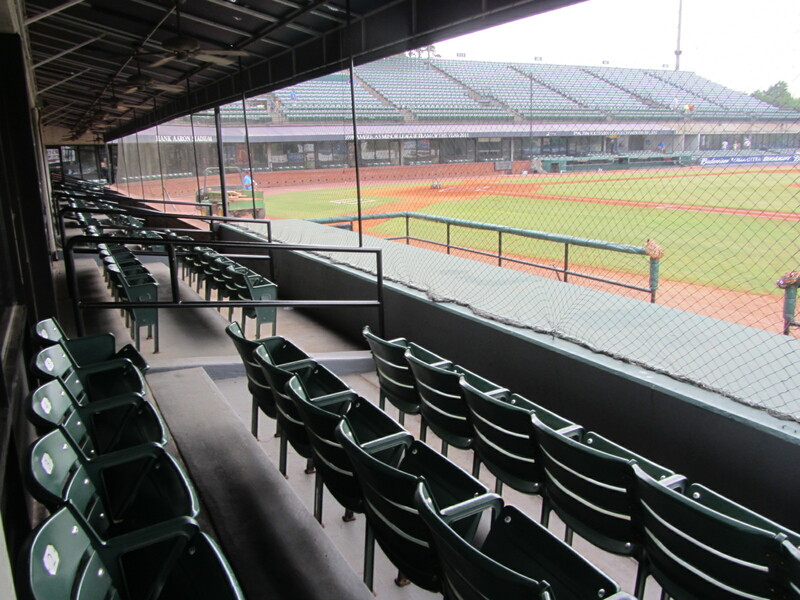 I do like this approach to berm seating — optional and endlessly rearrangeable. 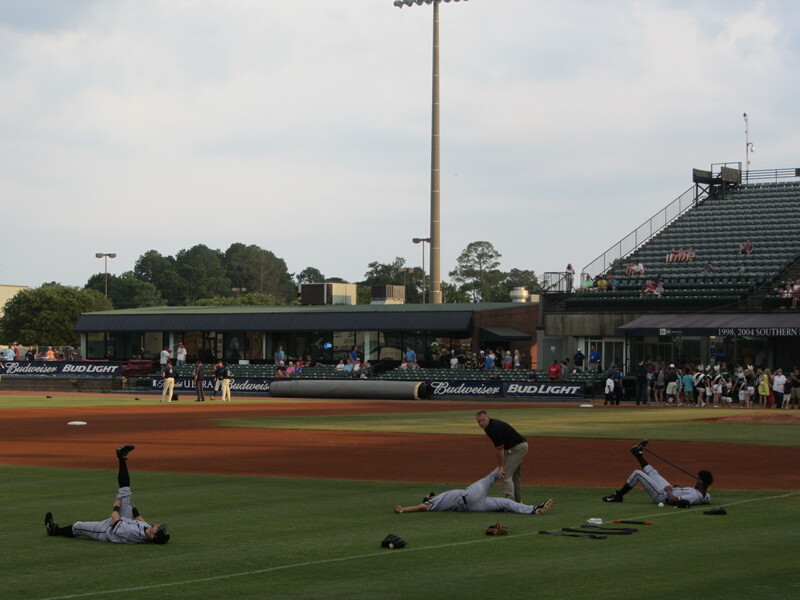 Meanwhile, on the field, the players were involved in an elaborate interpretive dance routine. 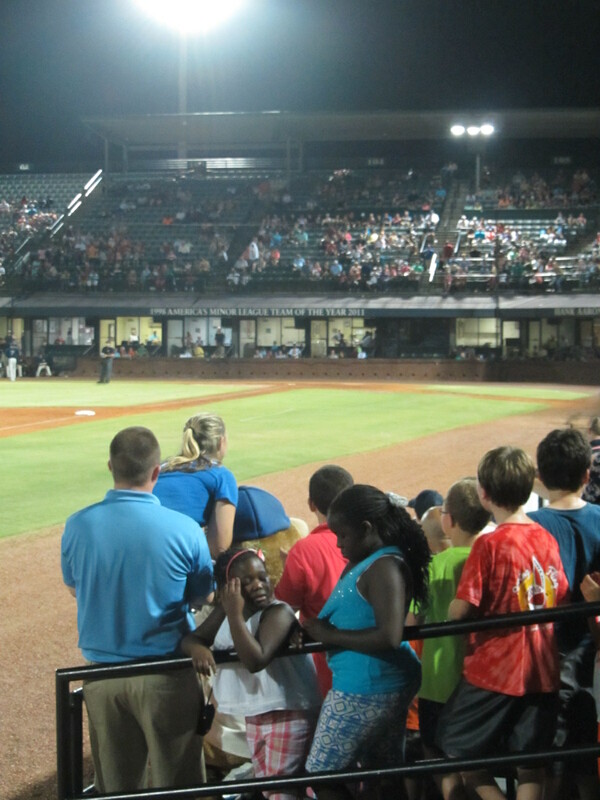 It was Faith Night at the ballpark, and a decent-sized crowd had begun to get settled into their second-level seats. 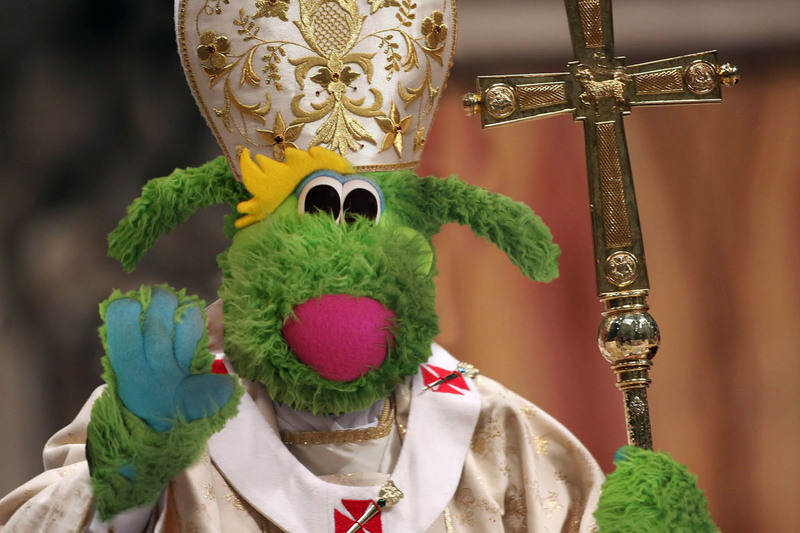 (And while I am a proponent of faith, I am definitely not a proponent of the insipid, lobotomized Christian pop songs that always seem to soundtrack Faith Night promotions. A deep, abiding, soul-fulfilling belief in a higher power should not be mutually exclusive with having decent taste in music). But that’s enough of my sermonizing. The game had begun. 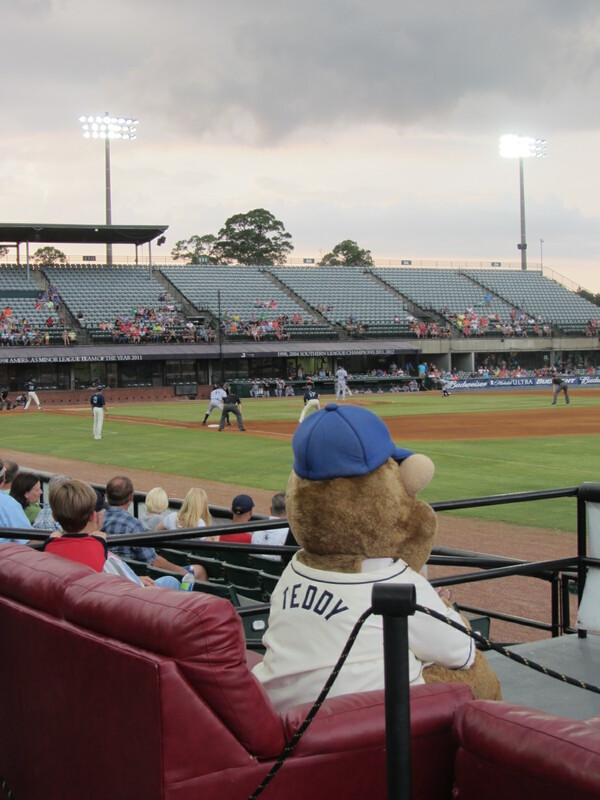 Mascot Teddy had settled in, presumably so that he could read this series of Mobile BayBears posts. That’ll do it for this one, but more will soon follow. The season never ends. 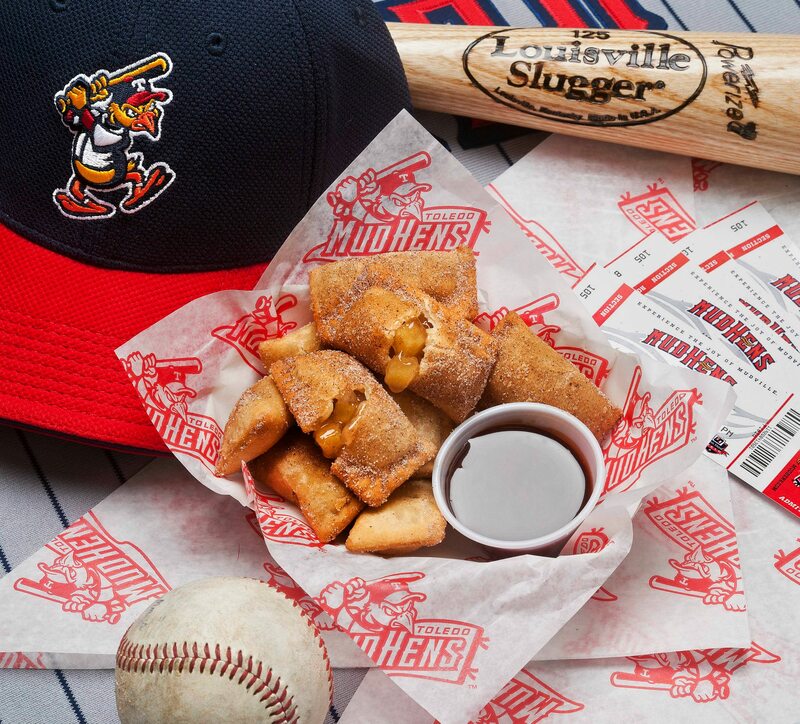 This season, when I’m on the road, I’ll be writing an on-the-spot blog post about each Minor League ballpark that I visit. Then, upon my return home, I’ll provide the multifaceted blog coverage that you have come to know and, perhaps, even love. Let’s get to it, lest it get to us! 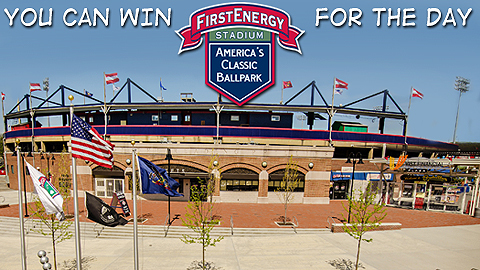 Opponent: Jacksonville Suns, 7:05 p.m. game time. 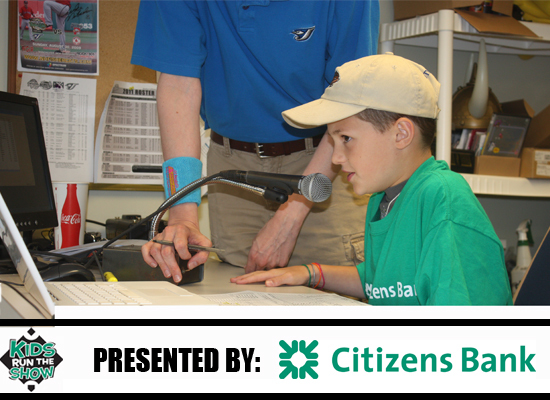 Ballpark Characters: Batboy Wade Vadakin (now in his 18th season) with his father, Jack (who drives him to every game). 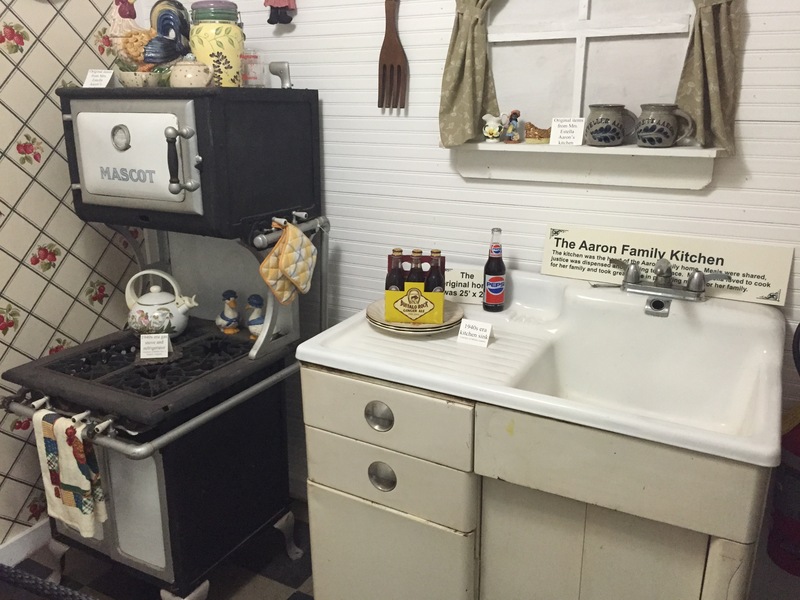 At Random: The kitchen in the Hank Aaron Childhood Home and Museum (located on the grounds of the stadium, open during every game).